My firm, Thin Line Capital, puts out a newsletter to its subscriber base, which I realize is doing double work given I also have this blog channel. However, until I sort that out, I thought I would start posting those newsletters up here for the broader community to read. This addition of the Thin Line is going to talk about electric vehicle adoption. 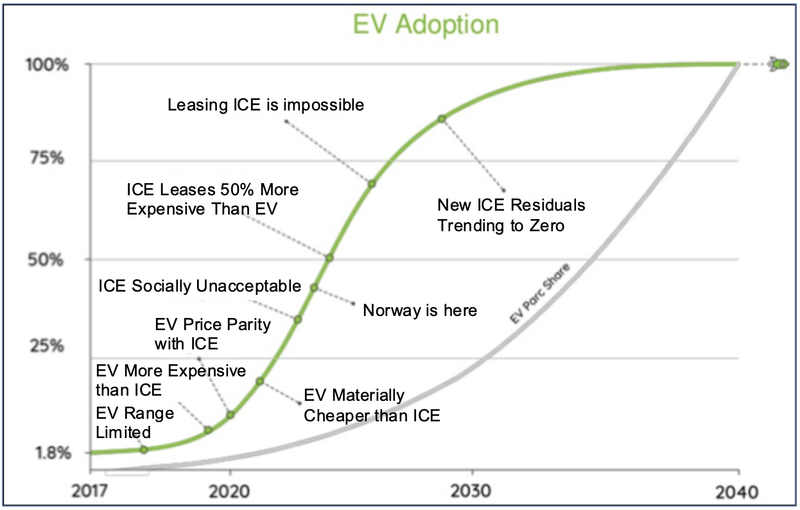 Although I’ve witnessed the inevitable adoption of EVs both back in the 1990s, and again in the 2000s, it really seems like we are at the start of a wave of adoption that is here to stay. Following the Thin Line thesis, we aren’t looking to invest in the companies that are making this happen (Tesla, GM), but we are looking for companies that will do well because of this wave. Some opportunities have already been identified. In the 1990s, Los Angeles pushed forward a policy for 2% zero emission vehicles in 2002 and 10% by 2010. This led to a flurry of activity with fuel cells and battery electric vehicles. I was heavily involved with two of the companies, Ballard and AeroVironment during this time. 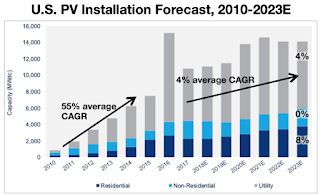 However, high costs and low range (as well as internal politics within GM, scuttling the EV) caused electric vehicle anticipation to be premature. However, critical to laying the foundation of EVs, was the launch of the Honda Insight and the Toyota Prius as hybrid electric vehicles, solving both the range issue, and allowing development into electric vehicle drivetrains to move forward. Then, in early 2000s, with the explosion of laptop and mobile phones, Tesla was able to ride this wave of battery development to launch the Roadster (2006), the Model S (2009), the Model X (2013), and the Model 3 (2016). Tesla’s success at high-end vehicles (which could bear a price point and volume which aligned with Tesla’s actual production capacity) encouraged GM to re-enter the market (first with the Volt, then the Bolt), and other companies followed. Today we are witnessing the beginning of a sea-change in the transportation sector. Around 4M passenger cars a year are produced in the US, and around 73M worldwide (up from 53M in 2007). This is an example of a tremendous opportunity, which will reshape the automotive, oil and gas, and electric industries with this transition. 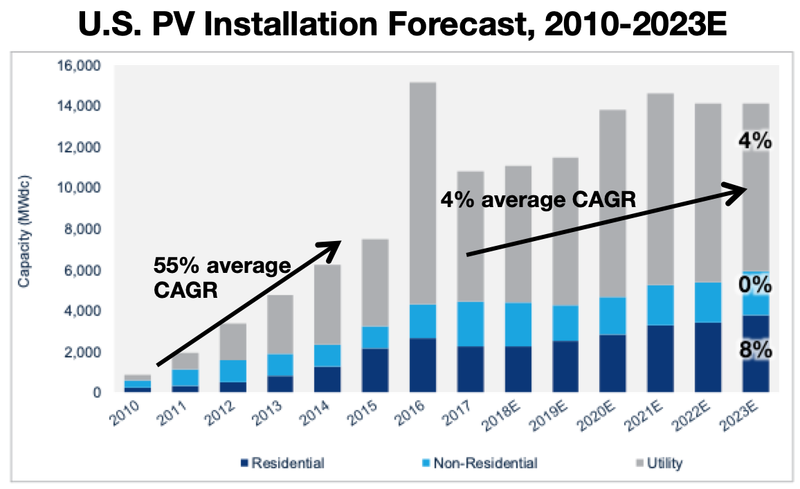 While the automotive industry is growing at 2%/yr, the EV industry is growing at 63%/yr. A qualitative demonstration of the future is shown in the above chart. 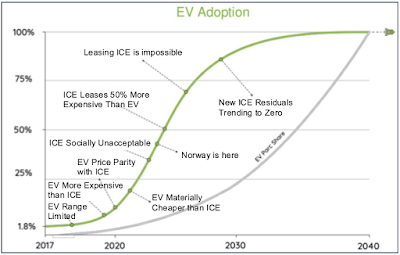 In the next five years EVs will be materially cheaper then ICE vehicles, and at that point we enter the steep part of the S-curve. It’s easy to assume that all of the EVs in the US are being driven down Rodeo Drive or Sand Hill Road. However, EV penetration, especially with lower-priced vehicles such as the Chevy Bolt (MSRP: $36,620) and the Nissan Leaf (MSRP: $29,900), has reached well into the middle class. Beyond the US is the great opportunity that is China. 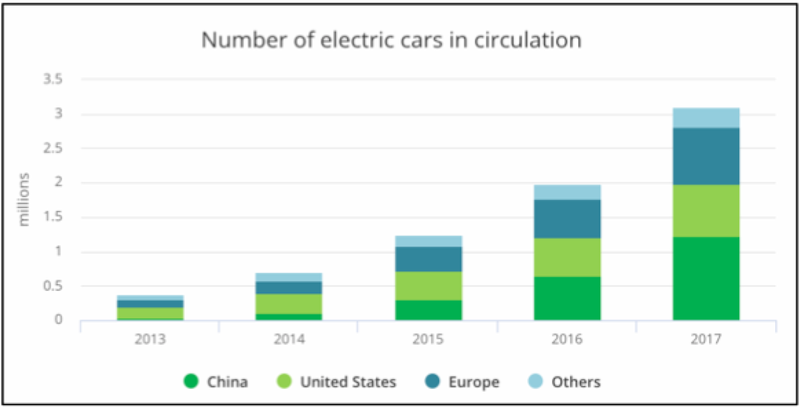 In 2016 the number of electric cars in China surpassed that of the US, and now in 2018 it is over double. While opportunities in the Chinese EV market may be beyond the specific interest of Thin Line, the overall benefits to the ecosystem are not. As the total number of vehicles manufactured (by all OEMs) increases, costs drop for everyone, due to greater efficiencies all throughout the supply chain. As costs drop, adoption increases, and we move further along the adoption curve described above. Thin Line Capital’s investment thesis is to pursue low-capex companies that take advantage of building themselves on top of existing megatrends. There are two opportunities that Thin Line Capital is investigating now that follow this thesis. The first company is an team out of Stanford, who had prior careers with O-Power and with Tesla. 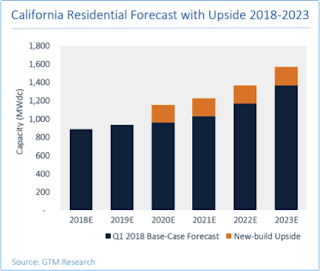 They realize that there is a tremendous opportunity to help utility companies manage the grid by taking advantage of, and solving the problems caused by, the increased deployment of EVs. 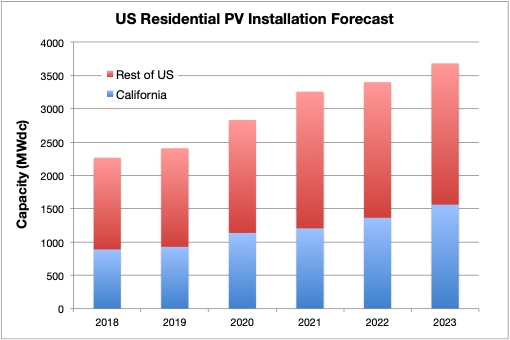 A typical house uses around 2kW peak load, and most distribution grids are sized for this peak. However, a Tesla charger, for example, draws 19kW peak and if several people come home and start charging their cars at the exact same moment, then there is real risk of the distribution grid failing and the local transformer burning out. Even worse, utilities are very concerned about the liability of wildfires caused by these transformer burnouts, and yet they very much want to support EV adoption (which they see as a path for revenue growth). This company has an elegant, low-capex, software solution which can be deployed immediately to schedule remotely the charging of various EVs. Each car owner wakes up the next day with a full battery, but the distribution grid did not have to suffer the effects of high peak demand. The second company of interest has also developed a software solution. However, this is an embedded control system to allow for what is called “inverter soft switching”. Inverters (used in every EV, solar installation, or energy storage application) use lossy “hard-switching” to convert DC to AC electricity (and back again). Soft-switching, with only 10% of the losses of hardswitching, was discovered in the 1990s, yet the ability to control the system wasn’t available. Advances in computing power and control algorithms have allowed this company to bring this technology to market, and they are in discussions now with a large OEM to integrate their solution into the OEM’s electric vehicle product, increasing range by 12%. Hey, Climate Reality posted a video of me . If you are in southern California and would like me to speak at your organization (I've given talks to Tesla, Idealab, Google plus various schools) reach out at aaronfyke at Gmail. Allow me to spark a likely controversial discussion. I am not sure that limiting pipeline capacity is in the best interests of reducing climate change. In fact, it is my argument that the carrot of expanding pipeline capacity could provide regulatory agencies enough leverage to extract significant clean energy funding, and put substantial carbon-reduction policies in place, that would not otherwise be possible without this opportunity. Now, in the case of Alberta, expanding the pipelines (both the Keystone XL, and the Trans Mountain) will allow for greater Canadian oil to get to market. Both of these expansions have been heavily criticized. So how could they *possibly* be good for climate change? Allow me to explain my thinking. First, a quick diversion - the Trans Mountain pipeline and the Keystone XL pipeline met the most resistance from First Nations groups, regarding the location of the pipeline and concerns over local environmental damage (ie, pipeline leaks). I’m almost uncomfortable with the attachment of the phrase “Indigenous Groups” to the media articles - *all* property rights should be protected and I suspect that if these were white farmers unwilling to relinquish their land that the discussion would be very different — historically, marginalized groups with low political power have often borne the brunt of “progress”. Local environmental spills are a concern, and may well be significant in their own right (the Supreme Court of Canada thinks so), but that won’t be part of my argument. Now, back to Climate Change. 1) The amount of CO2 released to the atmosphere is a function of global oil consumption, which is a function of global oil demand, which is only weakly tied to oil prices. Therefore, if Canadian oil were throttled, the oil burned globally will simply come from somewhere else. The only question, then, is if the addition of the pipeline capacity would be enough to move global oil prices to increase global consumption. My feeling is that it would not. 2) Canada has much more stringent worker safety and environmental regulations than many other nations. Every drop of oil which doesn’t come from Canada may just as likely be produced from Angola. Therefore, from an environmental protection concern, and from a global emission concern, if the carbon intensity of Canadian oil is less than that of other producing nations, then the CO2 emissions from a policy of throttling Canadian oil may well go UP. Alberta and Canada are very serious about reducing methane emissions, with a goal of reducing methane emissions by 45% by 2025 - not a small goal, and not far away. 2a) This is a minor point, but worth mentioning. An oil industry executive recently mentioned to me: “The only thing worse, from a potential leak perspective, than a new pipeline is a *really old* pipeline”. My father worked as a welder’s assistant on the pipelines in Canada when he was in high-school — the Canadian pipelines are old, and represent increased environmental risk. Furthermore, without pipeline capacity, the oil from Alberta is being sent to Texas via rail and trucks, which poses a greater risk of catastrophic failure, and much greater carbon intensity (those trucks aren’t running off of fuel cells). Roughly 2.8 million barrels a day of oil are produced in Alberta. If Alberta could sell that oil at a 15% discount to WTI, that would be $33.5B/yr more revenue from oil sales, at the same quantity of oil. 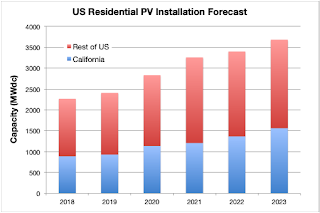 Imagine if, say, 25% of that were pumped into clean energy development? Imagine if the attraction of an increased $33B into the economy allowed the government to impose aggressive carbon reduction policies. Humans are short-term thinkers, that’s always been to our peril. Let’s use that to our advantage - provide a short-term carrot (increase pipeline capacity) with long-term policies that we need (aggressive carbon taxes or emission limits that restrict emissions quite quickly). Now, my numbers might be a bit off. This study (below) states that the Alberta government is losing $7.2B (CDN - $5.5B USD)/yr due to pipeline capacity limits, but seeing as the Alberta government only gets the oil royalties, I would expect that the $33B overall revenue number is correct. So, that’s my proposal. Find a way to increase pipeline capacity out of Alberta, respecting property rights of everyone (compensate all land-owners affected, and don’t target Indigenous Peoples' land), recognize that Canadian Oil has a lower carbon intensity than other producers, and that pipelines have a lower carbon intensity than other logistics methods such as rail and truck, and then use the revenue windfall as a multi-billion dollar investment program for clean energy deployment, and as a means of extracting the political will for aggressive carbon reduction policies. This is a complicated problem, and I feel that it may be necessary to lose a few battles to win the war. Here's a well laid out argument that encapsulates a lot of what I've been reading about and talking about for the past 20+ years. This is our moonshot, our "Day After Tomorrow", our Cuban Missile Crisis. Nothing is more important, on a short-term and long-term scale. Unbelievable! We are witnessing a real-life golden ticket! SpaceX and the #DearMoon project (https://dearmoon.earth/) announced that in 2023 there will be the first private passengers to the moon - Japanese entrepreneur Yusaku Maezawa and 6-8 artists that he will choose to go with him!